Those with an interest in knots, both young and old, will enjoy reading Why Knot? An Introduction to the Mathematical Theory of Knots. 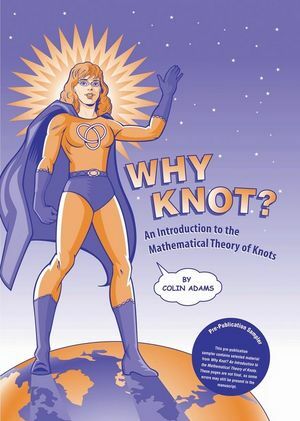 Colin Adams, well-known for his advanced research in topology and knot theory, is the author of this new book that brings his findings and his passion for the subject to a more general audience. Adams also presents a history of knot theory from its early role in chemistry to modern applications such as DNA research, dynamical systems, and fluid mechanics. Real math, unreal fun! Each copy of Why Knot? is packaged with a plastic manipulative called the Tangle®. Adams uses the Tangle because “you can open it up, tie it in a knot and then close it up again.” The Tangle is the ultimate tool for knot theory because knots are defined in mathematics as being closed on a loop. Readers use the Tangle to complete the experiments throughout the brief volume. This beautifully illustrated comic book is appropriate for many mathematics courses at the undergraduate level such as liberal arts math, and topology. Additionally, the book could easily challenge high school students in math clubs or honors math courses. Colin Conrad Adams is a mathematician primarily working in the areas of hyperbolic 3-manifolds and knot theory. His work has been praised for its accessible approach to advanced topics in knot theory.